Professor Darish Al-Azmi of the College of Technological Studies, Kuwait, had donated a radar measuring equipment to the University. 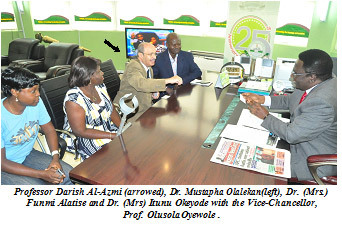 Professor Al-Azmi, a personal friend to the Head, Department of Physics, Dr. Amidu Olalekan Mustapha, made the donation during his recent visit to the Vice-Chancellor, Professor Olusola Oyewole. The equipment constitutes the Gamma Ray Dosimeter for measuring radiation and other devices for measuring radioactivity in food and environmental materials. Speaking at the occasion, the Vice-Chancellor commended Professor Al-Azmi, Dr. Mustapha as well as other members of the Department of Physics for the donation, which he said would assist the University to attain its set goals and objectives.